Ask fellow campers about "Rod's Beach Resort" and nearby attractions. A great find. The owner keeps this park open as a courtesy to her old customers, who go back 50 years. I doubt that she takes credit cards. Sites are in an open grass area, with shrubs and trees surrounding it on three sides. On the ocean side, it's a 10 minute walk to a huge empty beach, using a home-made foot bridge to cross the creek. About a dozen sites have full 30 amp hookups. The rest are water and electric only. There is a dump station. There are four well-maintained rigs occupied by folks who help out with maintenance, all of them very pleasant. They keep the place looking quite nice, with acres of mowed grass. It is very informal. The office, pool, and bathrooms are closed. The only noise we heard was the surf. There was one other customer the weekend we spent there. Because of the peace and quiet, we prefer this park to the State Park five miles down the road. It's also cheaper. 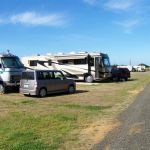 We camped at Rod's Beach Resort in a Motorhome. This is a small, old park with very little business. The owner is an older lady, keeping the park going on a limited basis since her husband died a few years ago. She is very nice. The park is very quiet, with only a few guests there. You can walk to the beach by crossing a small creek that is a few inches deep. There is beach access 2 miles up the road at Ocean City, or 5 miles to Ocean Shores. This park was a real 'find' for us, as we like a simple, quiet setting. Power water and sewer were a plus. We camped at Rod's Beach Resort in a Motorhome. Are you affiliated with Rod's Beach Resort ?